You are here: Home / Ethnic Groups / The People of Java / Who are the Baduy? The Baduy or Kanekes are a traditional Sunda community. “Baduy” may have been a name given to them by Dutch researchers. It is also possible that the name Baduy comes from the Baduy River and Baduy Mountain in the northern part of their territory. The group prefers to call themselves the Kanekes people, which comes from the name of the land where they live. They live at the foot of the Kendeng Mountain in Lebak Regency of Banten Province, about 40 km from Rangkasbitung city. They speak a dialect of the Sundanese language. In general, the Baduy are divided into three groups: tangtu, panamping and dangka. The tangtu, or the Inner Baduy, are the strictest in following their traditional custom. They wear white or dark blue clothing with white head scarves (worn by men). The panamping community is known as the Outer Baduy. They live in various settlements spread around the territory of the Inner Baduy. They are recognized by their black clothing and head scarves. While the Inner Baduy and the Outer Baduy live in the Kanekes region, the Dangka Baduy live in the two remaining Baduy settlements. The Dangka Baduy area functions as a buffer zone from outside influences. 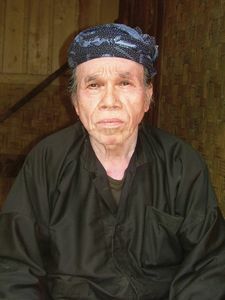 The highest ranking leaders of the community are the three puun, who live in each of the three Inner Baduy settlements. Daily administration of customary law, or kepuunan, is carried out by members of the community who carry the title jaro. There are four types of leaders: Inner Jaro, Outer Jaro, Security Jaro, and Government Jaro. For hundreds of years, the Kanekes community has practiced dry rice cultivation. They also obtain additional income from selling fruit, such as durian and tamarind as well as wild honey. The Baduy traditional belief system is known as Sunda Wiwitan. It is based on sacrifices made to their ancestor spirits. Throughout its development, Sunda Wiwitan has been influenced by Buddism, Hinduism, and Islam. Their core belief is in pikukuh, which means following an absolute set of determined traditions in their daily lives. The most important object of this belief system is Arca Domas, a secret location that the Baduy consider to be the most sacred place in the world. The Baduy visit Arca Domas to make sacrifices once a year in the month of Kalima according to the Baduy calendar. Only the highest chief and a few chosen members of the community may sacrifice at Arca Domas. There are hollows in the rocks that store rain water at Arca Domas. The Baduy believe that if the rocks are full of clear water at the annual sacrifices, then there will be plentiful rain that year and the harvest will be good. If the rocks are dry or contain muddy water, then the harvest will be poor. Most Baduy people are still very isolated from modern technology, especially those who live in the Inner Baduy area. The Baduy need to choose between retaining their culture and technological advancement or else work to find a balance between the two in their way of life.